Lucyd is an augmented reality company building first lightweight, prescription-ready and mainstream smart glasses with blockchain app ecosystem. Lucyd Lens is possible thanks to 13 advanced optics patents and an AR app blockchain. The Lens will be supported by the Lucyd Lab blockchain, which makes it easy to develop and distribute AR-native content. It’s all powered by the LCD token, which organically drives content creation for the first AR platform with mass appeal. In short, Lucyd is creating a new AR ecosystem, where anyone can swiftly develop, share and experience content on our user-friendly smartglasses. Lucyd Lab drives organic app development and user engagement by rewarding positive contributions to the Lucyd community (app development, content, user reviews, etc.) with LCD. 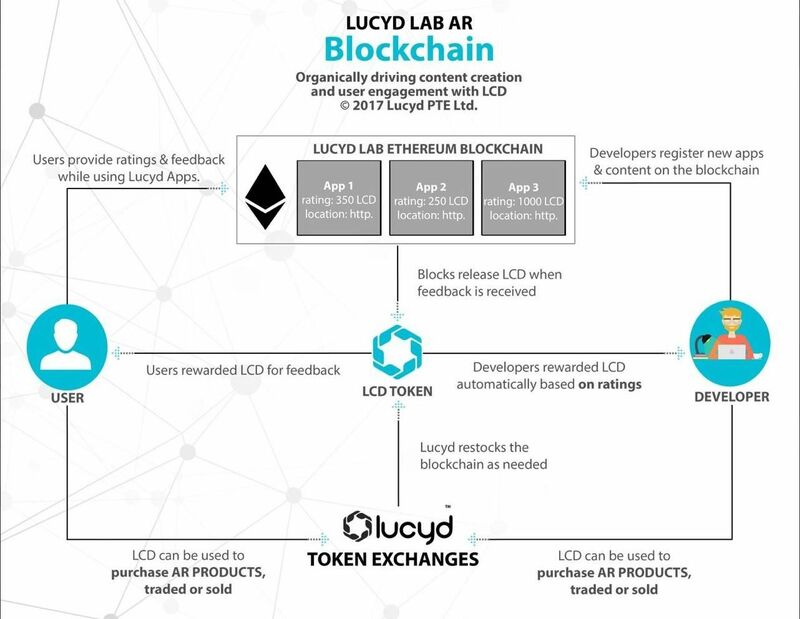 LCD can be used to purchase AR hardware and content from Lucyd when available, can be traded on token exchanges, and will enable lightning-fast peer-to-peer transactions among Lens wearers. We are going to automatically reward successful Lucyd developers with LCD based on community-gauged content quality, in addition to normal app revenue. We seek to build a new AR app ecosystem from the ground up, which will be totally peer-to-peer, allowing developers to keep almost all of the revenue generated from their apps. We are planning to release Lucyd Lens in early 2019. The first 500 crowdfund contributors over 4 ETH will have one of the first pairs automatically reserved. Just go to https://lucyd.co to purchase the LCD token, which we are using to crowdfund the development of our next-gen smartglasses. This is a locked-in promotional price – normally, the glasses will cost more than this. LCD can be traded on token exchanges, or immediately cashed out in-Lens. Lucyd plans to release developer tools, productivity and entertainment apps made natively for its smartglasses, which may be hosted on the App Store/Google Play until our own app store is live. Such content would be purchasable via LCD. The key that will make Lucyd Lens be the smartglass that works for everyone is ergonomics. Ergonomics is the science of making products better fit their users. A key ergonomic goal is to create a transparent interface between people and the products they use. For AR smartglasses this is both literally and figuratively necessary. 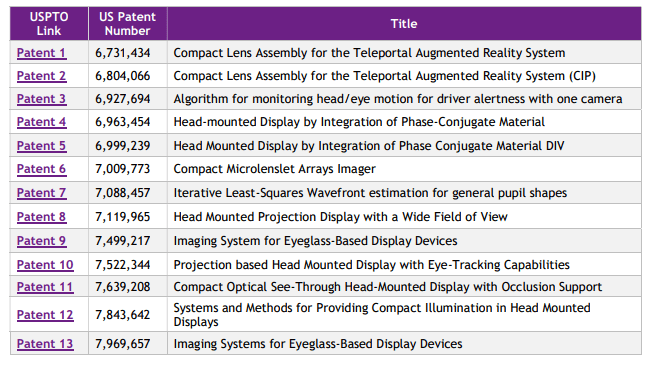 To fabricate ergonomically correct smartglasses, new optics technology is needed to reduce the bulkiness, weight and power consumption and to increase the field of view (most significant issues with current AR displays). Lucyd’s technology enables these features and additionally allows for prescription lenses to be incorporated in the glasses, so the 75% of the population that require corrective lens can enjoy the benefit of AR. 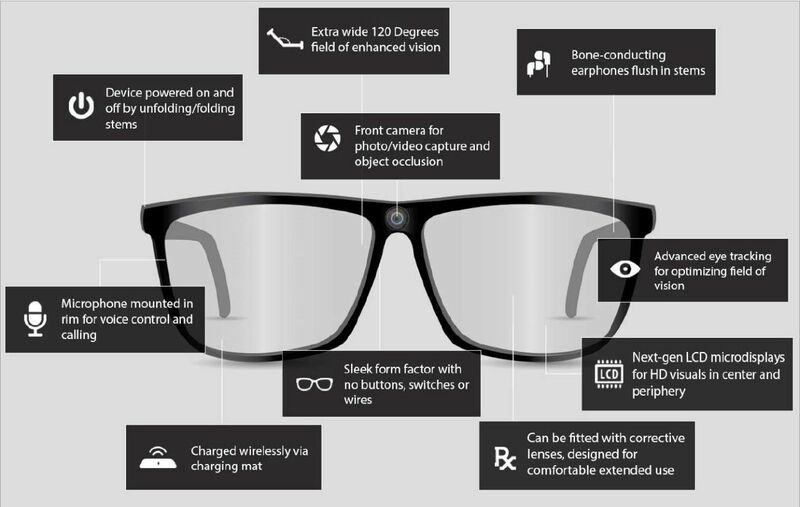 These are features needed to bring smartglasses mainstream. ​First to miniaturize the optics and electronics for compact, lightweight projection in a head-mounted display. This allows Lucyd Lens to be the first smartglasses that look and feel like regular glasses. First full integration of eye tracking in HMDs, allowing for ocular cursor control and real-time optimization of enhanced field of view (up to 120 degrees). First spatially aware smartglasses with enhanced object occlusion, so AR objects in the Lens meld smoothly with your real-world environment. First freeform optics system allowing for off-axis virtual objects and high-depth interface. First integration of binocular, flush HD microdisplays. No protruding elements, low-eye strain & discreet. First smartglasses with highly modular controls, including finger tracking, voice control and eye tracking, all of which can be used to switch on and off the AR experience on demand. First smartglasses with low light leakage and high spatial resolution, for solid-seeming AR objects. First smartglasses that accommodate prescription lenses, for comfortable all-day wear by everyone. Lucyd Lens can replace your regular glasses. First smartglasses with no buttons, switches or wires, for a sleek look. Lucyd Lens will also charge wirelessly, for a totally next-gen experience. For more info on Lucyd’s hardware tech and impact on the augmented reality industry, please analyze the Scientific Review of Lucyd’s Technology. Solid tech is important, but a great team is even more critical for success. Lucyd has assembled the “Dream Team” of renowned experts in the optics, AR, app development and cryptocurrency fields. Our science advisors are recognized innovators in their fields. All in all, the people behind Lucyd combine to form a solid foundation for our potential success. We count among our staff and science board 7 noted Ph.D.’s in relevant verticals, as well as experienced financial, creative and blockchain experts. Konrad Dabrowski (CPA), Finance Lead is one of our cofounders and brings 8 years of experience with Deloitte as a financial auditor. Konrad will be responsible for accurate financial reporting, and governance matters including semi-annual project progress report to be reviewed by third-party auditors and released to token holders and the market. Eric Cohen is a Lucyd cofounder, and an experienced web & app architect. He has designed numerous apps and a vast amount of high-quality web content. He is leading the development of Lucyd native apps, and the front-end of our AR app blockchain. Harrison Gross is a Lucyd cofounder and lead architect of the Lucyd Lens user interface and the Logyc OS. He oversees all published content that Lucyd produces for its following online, including the Lucyd.co site. His writing and creative abilities are fundamental to public perception of Lucyd. The Optics team is led by Dr. Mike Kayat, who is a physicist and a business development executive with 20 years of experience in development and marketing in advanced optics. Dr. Clifford Gross, Strategic Commercialization Lead, is an experienced executive and entrepreneur who has licensed more than 100 university technologies, founded three public companies (NYSE, LSE) and is a named inventor on 19 issued patents from his research. Jose Enrique Hernandez is the Blockchain Lead for Lucyd, and has extensive experience in the cryptocurrency, mining servers and Blockchain software spaces. He oversees the core of the Lucyd Lab blockchain and the mechanics of the LCD token sale. Professor Jannick Rolland, the lead inventor behind 12 of Lucyd’s patents. Dr. Rolland is an optics expert and lead inventor on 12 of the 13 patents exclusively licensed by Lucyd. Professor Yiorgos Kostoulas, Ph.D, is an optics expert and Associate Professor at the Division of General Engineering at Vanderbilt University School of Engineering. Mikhail Gutin, Ph.D. is an optics expert and Founder and President of Applied Science Innovations, Inc. API conducts applied research and development in optics and imaging. Dr. Gutin has over 20 years of experience in many areas of optics, with an extensive record of patents and publications, and the R&D 100 Award by R&D Magazine. Donna Waters is an Optics Expert with 20 years of experience in the research and development of optical instruments and devices. As an expert with Proof of Concept Optical Engineering, LLC, she has designed optics for a wide variety of AR and VR prototypes, including diffractive lenses and illumination systems for holographic waveguides. Maribeth Gandy Coleman, Ph.D., is an expert in wearable computing & AR. She serves as a Principal Research Scientist and Director of the Interactive Media Technology Center at the Georgia Institute of Technology. Professor Hao Li is a Lucyd science advisor, and a well-recognised AR expert. His work revolves around dynamic shape reconstruction, real-time facial and body performance capture, 3D hair acquisition and garment digitalisation. Additionally, Pedro Lopes is a science advisor expert in Haptic AR and a Human Computer Interaction Researcher at the Hasso Plattner Institute, Germany. To learn more about our team please visit https://lucyd.co. According to Digi Capital, the AR market is forecasted to reach approximately $83 billion by 2021. IDC has also forecasted that AR headsets may reach 25 million units by 2021. Following the usual hype cycle, AR technology platforms are moving toward mainstream adoption in the next few years to potentially create a multi-billion dollar market. One of the key drivers will be the availability of reasonably priced, hands-free AR devices in the form of lightweight, stylistic “smart glasses” (or AR headsets) which have the potential to replace smart phones, smart watches and other wearables like fitness trackers. The size and weight of these AR glasses are important to mainstream users. The market leaders will need to produce AR eyewear formats that are small, lightweight with minimal optical distortions. Advanced features like eye tracking and the ability to use traditional lenses in a range of styles and high resolution images will be highly desirable. Lucyd’s technology addresses all of those aspects and have significant potential to tap into this lucrative market. At Lucyd we believe our token sale is the best ICO out there given our hardware tech advantage addressing the new exciting industry, our blockchain app ecosystem, knowledgeable and experienced team, as well as our strict governance standards. 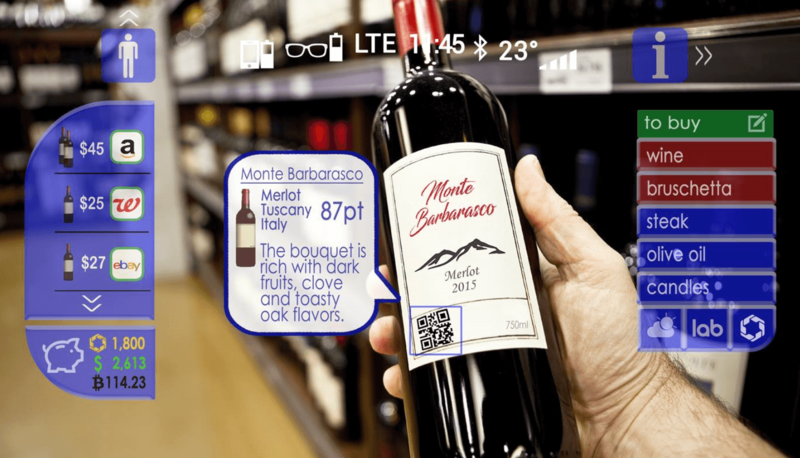 This, combined with promotional offers of tokens and reserving first glasses below market price and referral program, gives you more than enough to enter the LCD world!